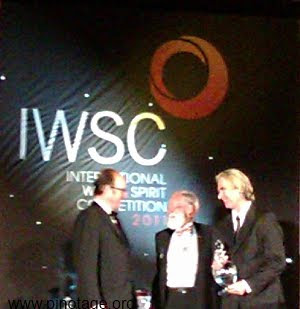 Andrew Milne, Chief Executive Officer of Spier received the Dave Hughes South African Producer of the Year Trophy from Dave Hughes in the presence of HRH Prince Robert of Luxembourg in front of 500 members of the international wine and spirits industry at the IWSC awards ceremony in London’s Guildhall. Pictured left to right: HRH Prince Robert of Luxembourg, Dave Hughes, Andrew Milne. 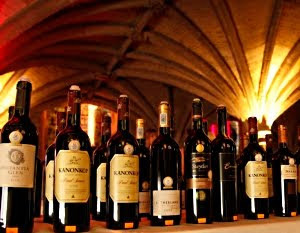 Spier was picked from a shortlist comprising Kaapzicht Estate, Kanonkop Estate, Fleur du Cap, KWV and Nederburg. This evening I am in the splendour of London’s 800 year old Guildhall at the International Wine and Spirits Competition (IWSC) awards ceremony. 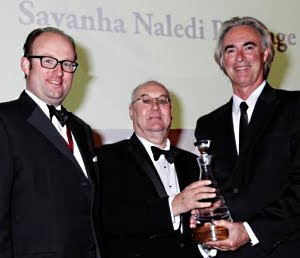 I am representing The Pinotage Association to present the Abraham Perold Trophy for Pinotage sponsored by the Pinotage Association to Spier Wines for their Savanha Naledi Pinotage 2009. Spier, whose winemaker Frans Smit is pictured left, are on a roll. They also won the IWSC Mission Hill Trophy for Chardonnay for their Spier Private Collection Chardonnay 2009 and are on the shortlist for the IWSC Dave Hughes Trophy for South African Wine Producer, plus Best in Class Gold medals. And earlier this year Savanha Naledi Pinotage 2009 was a ABSA Pinotage Top 10 winner. Spier is on the agenda of most people who visit South Africa’s winelands. Not only are there wines to taste but a hotel, restaurants and a large garden with a river and lake plus a cheetah outreach project where visitors can get close to these beautiful endangered creatures. 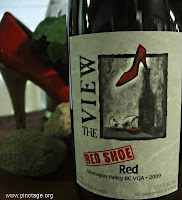 I’ve been going there for the past 15 year but until this year I knew very little about the wine side. Sure there’s a tasting counter but you can’t see any vines nor had a winery and I had assumed Spier was a sort of virtual operation, buying in grapes and renting winemaking space in other facilities. How wrong I was. Not only do Spier have many hectares of vineyards behind the garden, just out of sight over a ridge and they also own or lease vineyards in other areas of the Cape. Their large winery is surrounded with trees and equipped with some of the most modern equipment in the world. 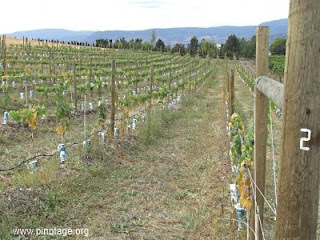 They practise sustainable farming, for their vines and food served in their restaurant and are undergoing a vigorous programme of removing alien vegetation to replace with indigenous plants that they breed in their own nurseries. I enjoyed lunch in ‘Eight at Spier’. This airy restaurant with outside seating has an open kitchen and serves a daily changing menu that depends on what is harvested on their own estate farm and other nearby farms. The food here is delicious, light and tasty and there is a good selection of meat free dishes. 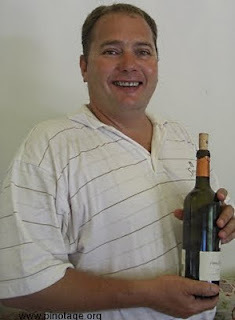 I met winemaker Frans Smit and tasted a range of his Pinotages. They have several different levels, Private Collection, Signature Series and Vintage Collection, the new premium 21 Gables range plus the Savanha label used for some export markets. 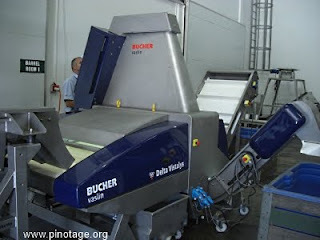 In the winery I watched in amazement a new grape sorting machine (above) being put through it spaces. This high tech machine scans individual grapes passing through it on a conveyer belt at up to 30 km an hour If one of its lasers encounters something other than a perfect grape a puff of compressed air shoots the rejected item up where another burst of air jets it into a discard hopper. The machine can be set to recognise different grades of grapes so it is possible to sort grapes destined for various bottlings. Spier hand sort grapes for their premium labels but there is not enough time to hand sort all the grapes for all their labels, but with the new machine they will be able to. Congratulation to the team at Spier Wines and to winemaker Frans Smit. More than 120 members of The Wine Society in the UK attended a tasting of a selection of South African wines featured in their latest shipment and voted on their favourite. "the clear winner was, unexpectedly, the most expensive of the offerings on show: the deliciously ripe and full Chamonix Greywacke Pinotage, 2007 from Franschhoek (£10.95). Pinotage is almost purely South African, being a crossing bred there in the 1920s from pinot noir and cinsault and rarely grown anywhere else. It makes a real variety of red styles and when treated with proper care, as it has been by Chamonix, it can really shine. This example is made in the ripasso style more familiarly seen in the Veneto of Italy which provides it with real velvety depth and richness. 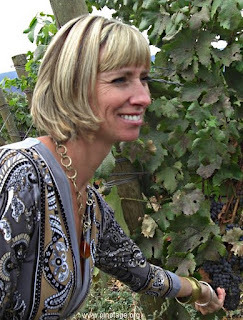 Our tasters bought more of this than any other wine and understandably so."